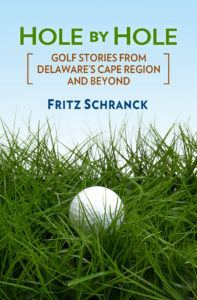 It’s hard to overstate how glad I am that you helped keep me from receiving all kinds of golf stuff during the many years I’ve been writing this column. Since I intend to keep writing it, I will still need your help this year and beyond. If you’ve been following the news of the real or fake variety, you know that the past year has been a little tense, shall we say, in matters political. That’s probably the main reason that I really don’t want to receive my very own Mr. Prez Headcover for my driver. Having President Trump sticking out of my golf bag is a risky proposition. If I were an anti-Trumper (and I’m not saying I am, and I’m not saying I’m not), why would I intentionally annoy myself with the sight of our current national leader every time I played golf? 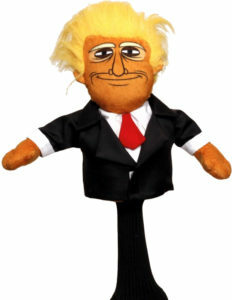 And if I was a huge Trump fanatic (and I’m not saying I am, and I’m not saying I’m not), then having one of these headcovers would just give some anti-Trumper an incentive to give me a hard time, such as by shouting obscenities at me during my downswing. Some of that swearing happens already, but that’s usually just me. We don’t need any more noise pollution like that on the golf course, so despite the $32.95 price tag at ReadyGolf.com, this one’s a no-go. 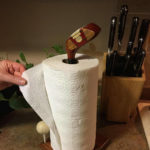 I’m also not that interested in the Golf Club Paper Towel Holder, sold at etsy.com for $49.00. I suppose it’s nice that someone came up with a way to recycle all those old wooden golf club heads, like the kind I used thirty years ago. However, keeping a golf club head in the kitchen as a “decorative” element seems a bit much. Besides, when the grandkids visit we go through at least a roll of paper towels every day. One of those little rascals could grab the club head post while I’m replacing the empty tube, and there’s a little safety problem there. 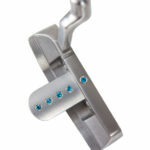 The Brilliant Blue Topaz Jeweled Putter that is also found on etsy.com is a bit problematical, even if I wasn’t already blinking at its $299 price tag. Staring at five 5mm blue topaz jewels set into the alignment guide while putting is a distraction I don’t need. On a sunny day, the little bits of blue reflected light twinkling on my follow-through may also be too much for my playing companions. I’m really just being considerate, you see. 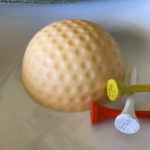 Being considerate of other’s sensitivities is also among the reasons I would rather not receive a shipment of Golf Ball Soaps, sold at etsy.com for $4.50 each. I can appreciate the fact that the soap is made from “Goats Milk and Essential Oils” and that the makers thoughtfully cut them in half so the 4 oz. balls don’t roll away when you use them. It’s just that I have enough golf memorabilia in my office area, and don’t need to spread that stuff into other parts of the house. I’m preserving domestic tranquility. I also have to admit I was surprised to see the tee-holding feature on the Country Clubbin’ Skort I saw on ebay.com for $39.95. I’m not a skort wearer myself – but the skort-wearing golfers I know have a much better place to keep their golf tees than mid-thigh, hidden behind the skirting. For instance, on the LPGA tour, tees are usually jammed into the ponytails sticking out of their hats. If I somehow received one of these skorts, I think I’d have some trouble re-gifting it. 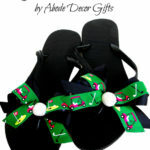 Finally, I am not too keen on the Golf Ball Flip Flops that are on sale at etsy.com for $24.95. The fabric straps show a repeating golf cart theme, interspersed by crossed golf clubs. The ad copy says it would be a “unique” gift item, which for me has become a dead giveaway that I should avoid any such thing. Thanks again for the opportunity to tell you what I don’t want for Christmas. Have a great holiday, and say hello to the elves and Mrs. Claus for me.